Mushrooms are commonly used in Asian cuisine. It offers an exotic feel to any dish. Mushroom contain plenty of nutrients such as B complex, vitamin D, copper, potassium, selenium, chromium and phosphorus. Since ancient times, it is believed that mushrooms have significant healing powers that can cure a host of diseases. However, did you know that mushrooms have anti-aging and whitening effects to the skin? In fact, several anti-aging products such as La Prairie Anti-aging Stress Cream and Origins Mega Mushroom Skin Relief Eye Serum contain mushroom extract. 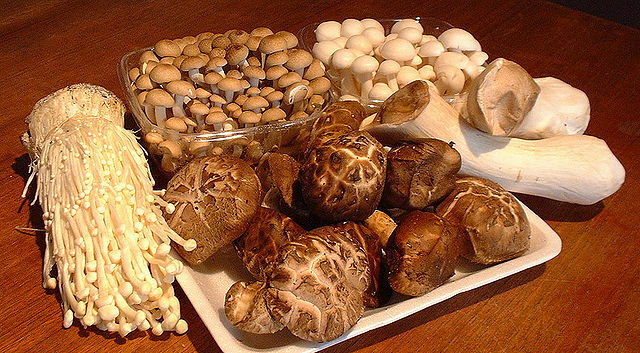 Fact #1: Mushrooms can help improve eczema, acne and rosacea. Mushrooms contain anti-inflammatory properties which make it an ideal dietary addition for those suffering from eczema, acne and rosacea. For instance, reishi mushrooms contain ling zhi 8-protein and ganodermic acid, which act as anti-inflammatory and anti-allergenic agents. Apart from these properties, mushrooms also aid in keeping the circulatory system and immune system healthy. Fact #2: Mushrooms can help combat wrinkles. Tremella, shiitake and maitake mushroom extracts are often used in anti-aging and beauty products because of their anti-wrinkle properties. Shiitake mushrooms contain L-ergothionine, an anti-oxidant that prevents the breakdown of cells. It also acts as a natural skin exfoliant. Dead skin cells are removed periodically to reveal youthful, glowing skin. Fact #3: Mushrooms can lighten skin naturally. Shiitake mushrooms contain kojic acid, which is a known skin lightener. Kojic acid can lighten blemishes, age spots and liver spots. When used regularly, it can lighten the skin and even out skin tone. It inhibits the production of melanin thereby causing the skin to lighten. Mushrooms are a safer alternative to skin whitening unlike some beauty products that contain harmful chemicals such as hydroquinone that can possibly cause skin cancer. Fact #4: Mushrooms can plumpen and hydrate the skin. Some mushrooms such as reishi and cordyceps have skin hydrating properties that makes them a favorite in facial creams and skin moisturizers. Mushrooms are also rich in polysaccharide, a type of polymer that interacts strongly with water. A sufficient amount of water in the body ensures that the skin is wrinkle-free, firm, plump and filled out. Fact #5: Mushrooms can quickly heal wounds and scrapes. Apart from skin hydration, polysaccharides also have immune strengthening, anti-allergenic and anti-hypersensitive properties. For this reason, mushrooms can help heal wounds and scrapes quickly. Topical application of products with mushroom extracts can also aid in the healing of insect bites, rashes and minor skin irritations. If suffering from sunburns, applying a product with reishi mushroom extract can also hasten the skin’s recovery. Mushrooms may be considered as toxic if ingested in excess. However, if moderately used, it can have amazing properties to the skin. In addition, mushrooms are also considered as superfood because they can help heal various diseases such as cancer, diabetes, hepatitis, kidney disease, respiratory problems, dementia, hypertension, cardiovascular disease, hypercholesterolemia and sexual dysfunctions. Other popular types of mushrooms known to have medicinal and therapeutic properties include agaricus, chaga, coriolus, enoki,lion’s mane and meshima.